"Called and company was very prompt in responding. Service very effective and we no longer have ants. A thorough inspection of basement and exterior was provided." EcoSystems provides pest control products and services in harmony with the environment. We are a small, family owned business which provides personal service and expert advice to homeowners, corporations, as well as the ever changing pest control industry! To keep our workplaces, outdoor recreation areas, and homes free of unwanted pests while maintaining a clean environment! Our company has changed with the times in order to provide innovative and safe techniques for the elimination of pests in our homes, workplaces and outdoor places of leisure. With the advent of non-toxic baits and traps, growth hormone regulators, and natural pheromone attractants, many of today's pest problems can be solved without the use of pesticides of any kind. For the ones that do require an insecticide, many of today's formulations are extremely safe and odorless, while providing excellent pest elimination! 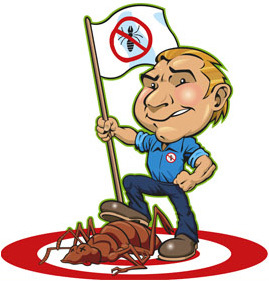 As licensed pest elimination technicians we spend a greater percentage of our time working directly with our customers. For the last five straight years, 2003 thru 2007 EcoSystems has received Angie's List Super Service Award, which is given only to the top 5% of the companies they critique!